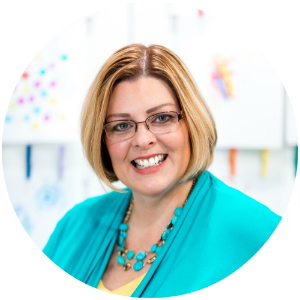 One of the many challenges teachers of young children have is where to store all the “stuff” necessary for creating a fun and engaging learning environment. 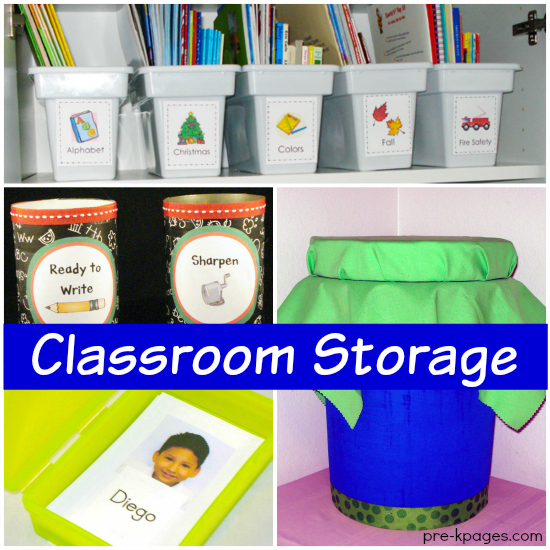 Lack of storage can be very frustrating; if only every classroom came with a 10 x 10 storage unit! 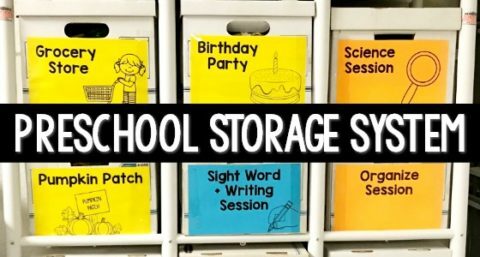 Until that dream becomes a reality here are some of my favorite classroom storage tricks you can try this year. 1. 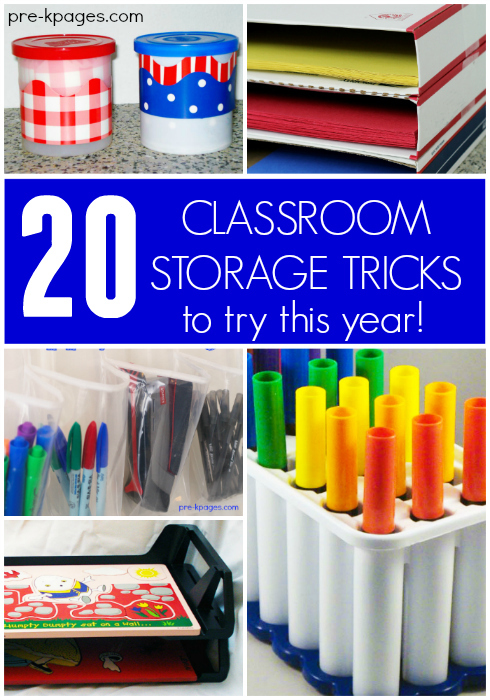 This is one of my favorite storage ideas of all time! Store your bulletin board border in frosting containers, snip off a small piece and tape it to the outside so you know which border is inside. Stack the containers on a shelf so you can quickly find the border you need. 2. Got paper? Stack and tape recycled priority mail boxes together to create an easy and inexpensive paper storage shelf. 3. No desk? No problem! Hang a clear shoe organizer on a wall or the back of a door to store desk supplies. 4. Capless markers? Store your markers upright in a water bottle ice cube tray so it’s easy to see if the caps are on. 5. Messy puzzles? 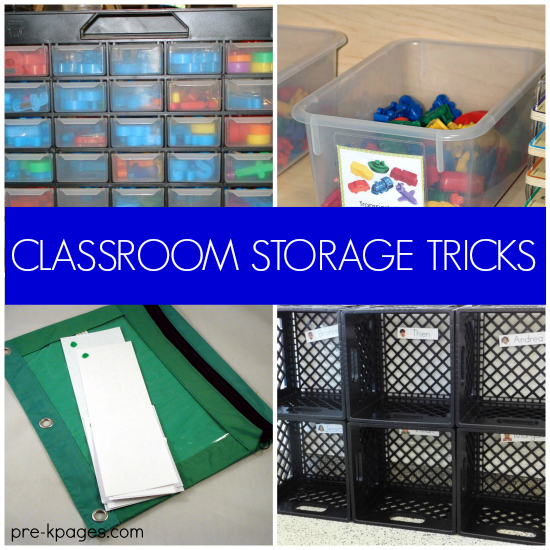 Stack inexpensive file trays to create a puzzle storage rack. 6. 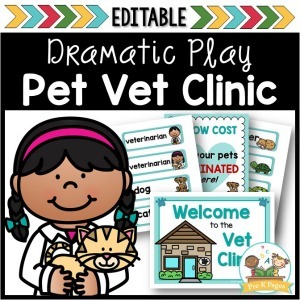 Too many magnetic letters? Use a nuts and bolts organizer to store your magnetic letters. Each drawer holds a different letter of the alphabet. 7. Hectic clean-up time? 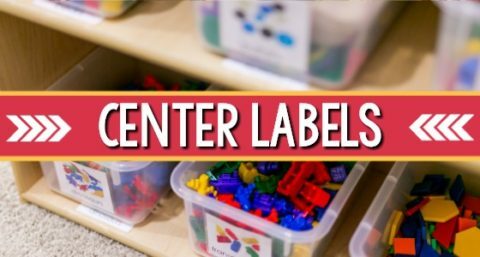 Use labels to organize and store center materials and facilitate a quick and easy clean-up time. 8. Store your pocket chart activities in colored zipper pencil pouches. Add a colored dot to the back of each piece to match the zipper pouch and ensure they don’t get misplaced. 9. 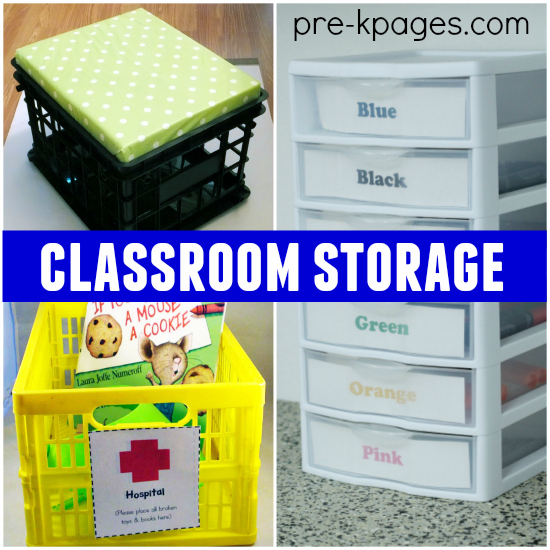 Learn how to easily create your own cubbies and classroom shelves with file crates. 10. Supply headaches? 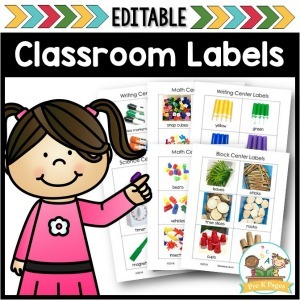 Store student supplies conveniently at each table with color coded table caddies for quick and easy access. 11. 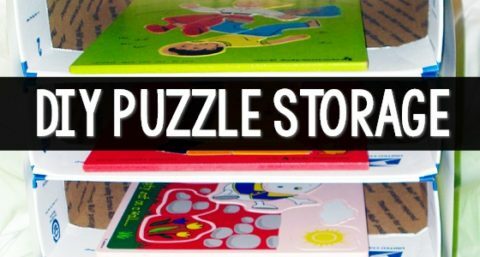 Upcycle priority mail boxes to create an easy puzzle storage rack. 12. Too much stuff? 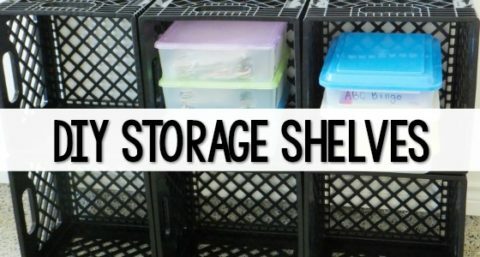 This PVC storage rack is the perfect solution! 13. Flannel board frustration? Learn how to create an easy, individual flannel board using a pizza box that includes storage! 14. Small space? 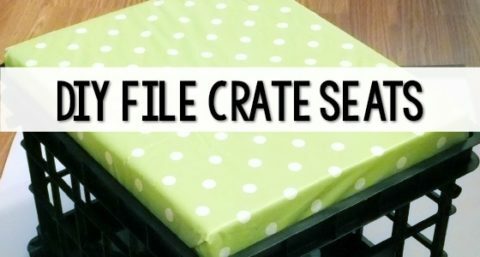 Turn plastic file crates into storage seats and save valuable space! 15. Can’t find it? 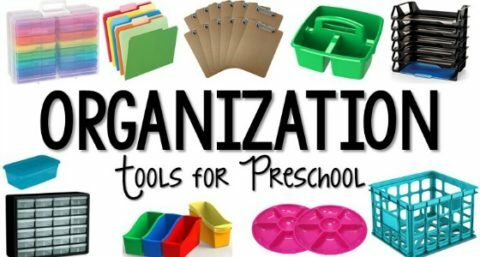 Store crayons and markers in tabletop drawers labeled with colored, color names for quick and easy access. 16. Got broken stuff? 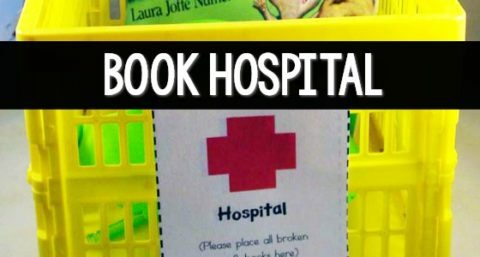 Here’s a quick and easy solution for dealing with broken books and toys. 17. Too many books? 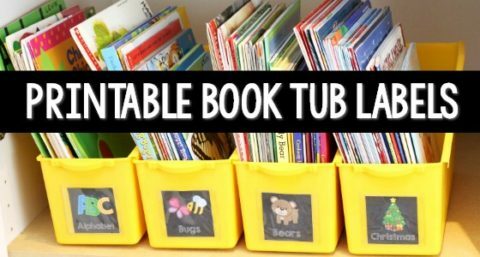 Learn how to organize and store your picture books for quick and easy access HERE. 18. Broken pencils? Decorate two cans and label one “ready” and the other “sharpen” and include picture cues. 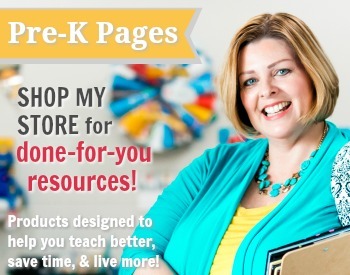 Now your students will know exactly where to put broken pencils and where to find sharp ones too! 19. One card short of a full deck? Store and organize your card games with this cool trick! 20. Learn how to turn mop buckets into cute stools that include storage! 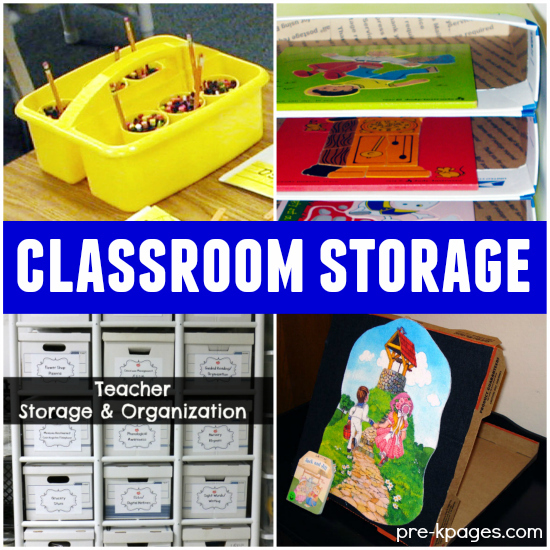 Next Post: Picture Books About Dr. Martin Luther King Jr.
Oh, I love that priority mail box paper storage idea! 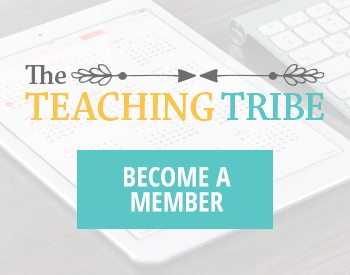 I don’t have a “classroom” but I’m going to use it at home. Genius! I bet it would work as puzzle storage too. Thanks for stopping by Amanda! I love using upcycled items whenever possible. Thank you so much.You always surprise me with your great ideas. Thanks for stopping by Salwa, so glad you enjoyed the ideas!